These vases, made in Sweden and designed by Stennett Willson, for J Wuidart & Co Ltd, as part of the "Whorl?" or maybe "Whirl?" range, have solid ball bases, and look like thay have been formed into four lobes and twisted. They have a polished 'ground' base. The stems have a narrow flare and are the same colour as the base. 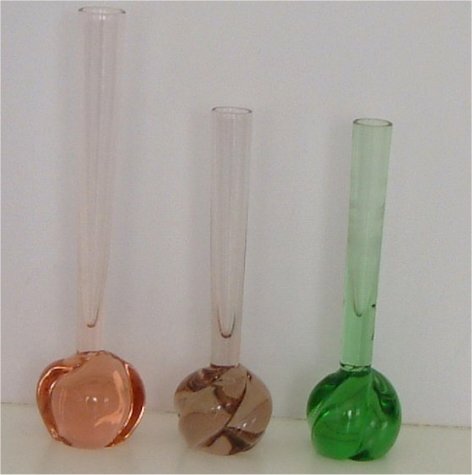 The smaller vases are approx. 150mm tall (stem diameter approximately 17mm). The label I have is quite worn, with some letters missing but can just be made out. 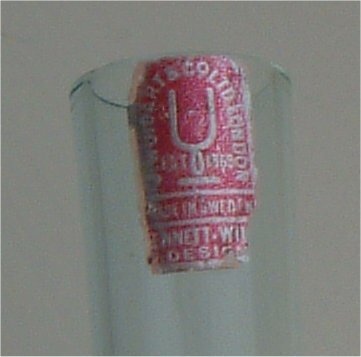 It has a red background with silver lettering which reads J.WUIDART & Co.Ltd LONDON EST 1869 MADE in SWEDEN Stennett Willson Design, and a logo of a stylised stem glass. 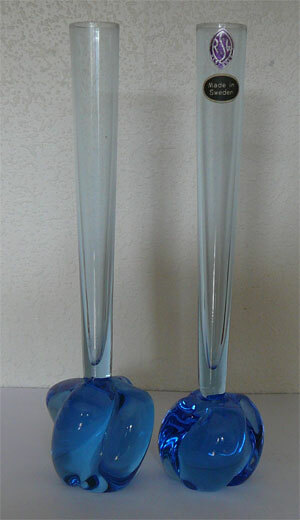 The taller vase is approximately 198mm tall (stem diameter approx. 20mm). Although similar to the others, it has less defined lobes, and I have now been reliably informed that it is NOT a Wuidart colour. It does however have all the characterisitics of a Swedish made vase, so more investigation work is needed. The following information on J Wuidart & Co. was kindly supplied by David Fletcher. J WUIDART & Co. of 26/28 Bartletts Buildings, Holborn-Circus, London EC4. was established in 1869. They imported mainly Scandinavian glass for retail. In the 30's they also commissioned James Powell and sons (Whitefriars) to supply Barnaby Powell designed Wealdstone glass for resale. They traded with Kosta and Orrefors as well as other import/export companies. In the 50/60's Ronald Stennett-Willson, joint Managing Director was active in designing and making glass for them. The last date I have found for them existing is 1968 but they may have continued after that. Stennett-Willson left and set up Kings Lynn Glass from 1967-69 and then after several takeovers etc was swallowed up by Caithness Glass. 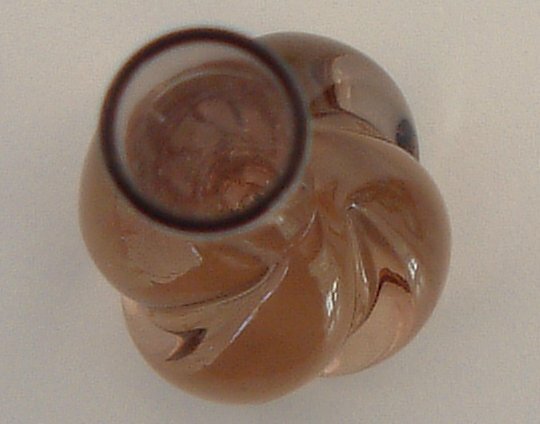 This image shows a close up of the twisted base. The following pictures have been sent by Tony Christie from New Zealand. 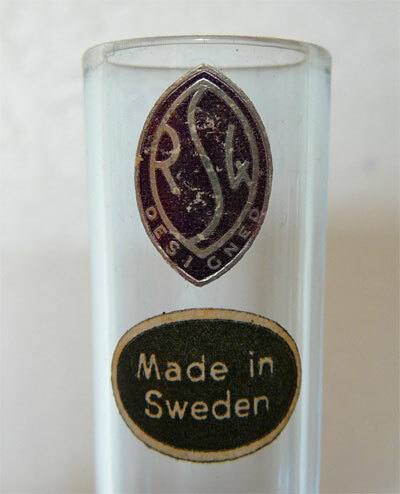 It shows two of this type of vase with a RSW (Ronald Stennett-Willson) label. It is possible that these were not made for J Wuidart & Co Ltd. and may also explain the peach one above.